Batman is hard at work, patrolling the streets of Gotham City for signs of trouble. Luckily, most of the worst super-villains are locked away in Arkham Asylum. Or are they? A turn of a power pad opens all the jail doors at once. Jail break! Oh no, Gotham City's worst criminals are on the loose! Batman flies into action, responding to the Bat-Signal blazing above the asylum. Turn the top power pad to reveal the disc launcher hidden behind the Bat-Signal. Press the button to fire the disks and send super-villains running for cover (villain figures sold separately). Can Batman get this madness under control? 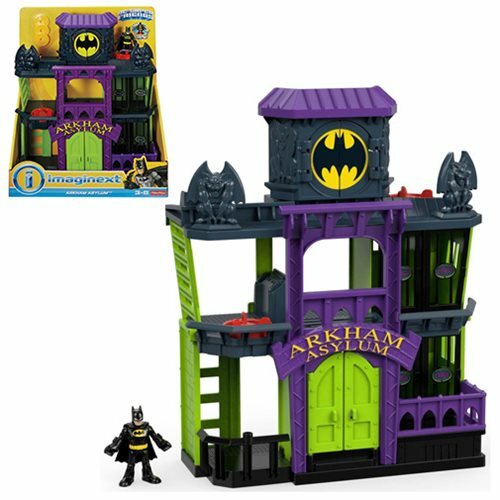 That's for your young Super Hero to decide with this DC Super Friends Imaginext Arkham Asylum Playset! Ages 3 to 8.